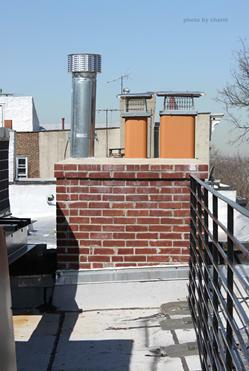 A Chimney Crown is a commonly neglected feature of a chimney; a poorly constructed or installed crown can be the reason for water leaks in your walls or ceilings all originating from a defective chimney crown. The lack of an expansion joint improper pitch of the crown or lack of a crown sealer can lead to premature cracking when seasonal temperature changes occur. 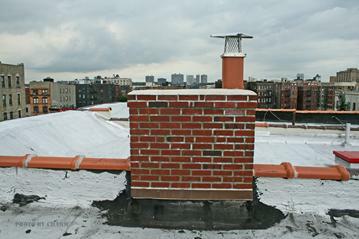 Heat/Frozen Water can expand inside the chimney and is commonly what causes cracking or spalling that can lead to leaks. We recommend a tapered (properly pitched) Crown of Portland Cement Mortar, so water will run off the crown and not leak into your chimney. The crown is coated with a flexible membrane crown sealant which does not let water penetrate the crown and is guaranteed for 10 years.